Haji As Puppet: An Orientalist Burlesque. Roger Sedarat. The Word Works. Washington, D.C. 2017. "We are but puppets; heaven but the puppet player." "Well I got the fever down in my pockets. The Persian drunkard, he follows me." 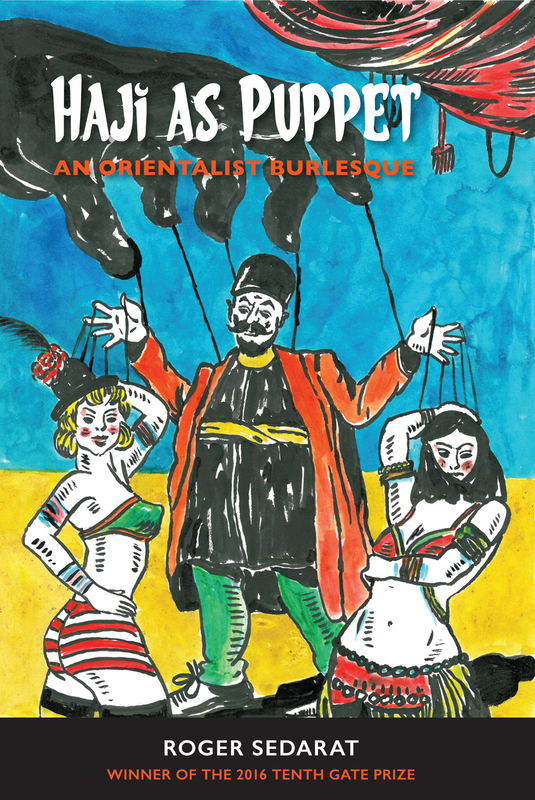 In Haji As Puppet: An Orientalist Burlesque Roger Sedarat is the trickster at full throttle. Haji As Puppet is out to confront every stereotype there is between the Mid-East and Texas. Sedarat is fearlessly inspired as he takes his Iranian-American heritage and romps. In the first poem Today's book of poetry will share Sedarat's co-conspirators/indicters include Marjorie Perloff, Kenneth Goldsmith, Wallace Stevens, Pablo Picasso and Ezra Pound. Sedarat people's his work with contradictions and hope until his true purpose is revealed. As his buddy Ezra would say "make it real," but Sedarat, the standing on his head modernist says no, "Let it be real." You'd be easily fooled into a casual and comfortable lull reading Haji As Puppet if you only followed the comedy, Sedarat has one hell of a sense of humour. But these poems are so much richer than mere humour. Sedarat isn't asking, he is telling; when he says "Let it be real." flavourless factoid, mimicry of mundane. ghostly bones of a close friend's suicide. remain just as they are. Is Sedarat claiming the ground between recent Noble Prize winning bard, Bob Dylan and Omar Khayyam? Is Sedarat setting up camp between a Persian poet of the past and a Jewish born, born-again minstrel from Minnesota? Well, yes. Sedarat's Haji As Puppet is political and confrontational, his unassailable reason as wide in breadth as his unapologetic black humour. How can you not rejoice when Willie the Shakes' Caliban goes to Harvard via the CIA and Nietzsche appears on the set of Paul Newman's classic "Cool Hand Luke?" Sedarat is setting a full plate with his "Orientalist Burlesque," this is no Genie-in-the-bottle Persian Night. Sedarat is beautifully seditious, he wants these poems to crack the colonial wall. its neck bleeding from an inadvertent cut. with graffiti on a billboard." Haji As Puppet allows Sedarat to loose Haji, his sensational everyman, onto the unsuspecting reader. It is a gift. Haji gleefully kicks the crap out of racist stereotypes that we have long accepted as reason in the west. Sedarat is relentless as he catalogues those places where cultures and race collide. His disdain at our collective ignorance is justified with the sharp edge of every single poem. Roger Sedarat romps through contemporary pop culture and the history of the world with equal candor and perception. If we are lucky Haji As Puppet will not be Haji's last poetic appearance. the sky the earth the moon all lost. Don't hand me wine. Pour it in my mouth. how do z'ey say, in the American manner? Inspector: Dites-moi, qui est Monsieur Sedarat? Haji: I do not know the man. Haji: He died as romantic martyr...for poetry. point you...how do z'ey say, get the pitcher? Sedarat takes a giant step towards demystifying the Persian world and debunking the west's lazy thinking. That's a lot to do in a book of poems. And he'll make you laugh. Roger Sedarat is an Iranian-American poet and translator, author of three previous poetry collections: Dear Regime: Letters to the Islamic Republic, which won Ohio UP's 2007 Hollis Summers' Prize; Ghazal Games (Ohio UP, 2011); and Foot Faults: Tennis Poems (David Robert Books, 2016). A recent recipient of the Willis Barnstone Translation Prize, he teaches poetry and literary translation in the MFA Program at Queens College, City University of New York. "From the opening act of this provocative literary burlesque, the reader will recognize the startling truths behind this timely and biting satire. Roger Sedarat's commentary about empire, its devious hold over our appetites and narcissisms, over our ignorance and phobias, confronts us with our complicity in our own manipulation, making us uncomfortable and accountable. HAJI AS PUPPET is political theater at its most entertaining, at its most daring." "Roger Sedarat has created what I consider one of the greatest masterpieces of the Iranian-American canon. HAJI AS PUPPET is a psychedelic romp through ancient Persian psyche all the way through modern Iranian hellscapes via the American imagination. This piercing Middle Eastern minstrelsy is unapologetically raw in its collisions with race, gender, sexuality, and pop culture. Sedarat truly understands the punk soul of Persian satire, and the way conviviality lives with calamity and pandemonium razes ritual. This is not your baba's Rumi—and thank goodness!"